PoliJet represents a breakthrough in CtP technology. It is the world's first and only, no process plate that can be imaged on high-resolution pigment-based large format inkjet printers (e.g. Epson Stylus Pro 900 series) and taken directly to the press for printing. The investment in the equipment and consumables cost significantly less than the analog systems (i.e. lith film & presensitised plate based). The PoliJet plate is ideally suited for low-cost multi-colour on-demand printing by sheet-fed offset using high-resolution conventional (AM) as well as stochastic (FM / Hybrid) screens. Direct-to-Plate-to-Press from your desktop computer, using a standard inkjet printer. 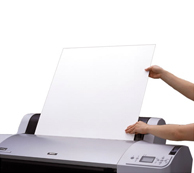 It is a single-colour, two-colours, spot colours and AM & FM / Hybrid screen capable, polyester plate. No process, silver-free, eco-friendly and daylight-working! Consumable costs are lower than the currently used analog systems (i.e. lith film & presensitised plate based). Highly affordable upfront investment. Payback period of a few months. Zero complexity. From installation to commercial production in an instant. Any format : 1, 2, 4 & 8 page format (using different plate thicknesses). Significant reduction in manpower and operational costs. The PoliJet CtP system is designed for production of any short to medium-run commercial work. It also offers the Quick Printers the opportunity to upgrade from laser plates to four-colour capable inkjet plates at similar costs. Shelf-life : There is no limitation on the shelf-life; however, for optimum performance, it is recommended that the product is used within 24 months from the date of packing. Storage : Normal air-conditioned office environment, away from excessive heat & humidity.